Age is a funny thing. When you are younger you can in to way comprehend what it will be like to be older, and when you are older, you forget what a crazy fool you were when you were younger. In a few more years, I can look back, and most likely think the same thing. Thank you all for your lovely birthday wishes - I had a very fun weekend filled with all the people I love the most, lots of good food, and great gifts - all the kind for wearing and shopping (the best kind, obviously) and I can't wait to share them! belated happy birthday to you darling! hope its not too late to greet. it's funny about age alright. when i turned 20, i realized age is nothing really but a number. it doesn't define us at all. hope you had an amazing one! You look so pretty in yellow! Glad you had a great birthday! Happy belated birthday! It's true, you know - whenever I think I've finally got things together, I look back a few years later and find I still definitely didn't have things figured out. I supposed the lesson here is that life is all about learning and that never really ends. I hope you have a wonderful years ahead, and I can't wait to see what you'll be wearing. This outfit is starting things off on a very good note, I must say - those silver pumps and your bracelet are to die for! Happy belated birthday! You look stunning. Your hair looks amazing!! Love this entire look. Lovely dress! Really like the navy dots against the bright yellow. Omgsh I so agree-I keep wondering when I am going to feel like I have actually "arrived" ha! I am glad you had such a great birthday--you look just darling in this color combo! It is funny isn't it? But I think it is mostly a good thing. You look lovely and I am glad that you enjoyed your special day! What a beautiful look birthday girl ! I've been a little MIA from the blog - hope you had a good one. Hugs! PS Cant wait to see the goodies. 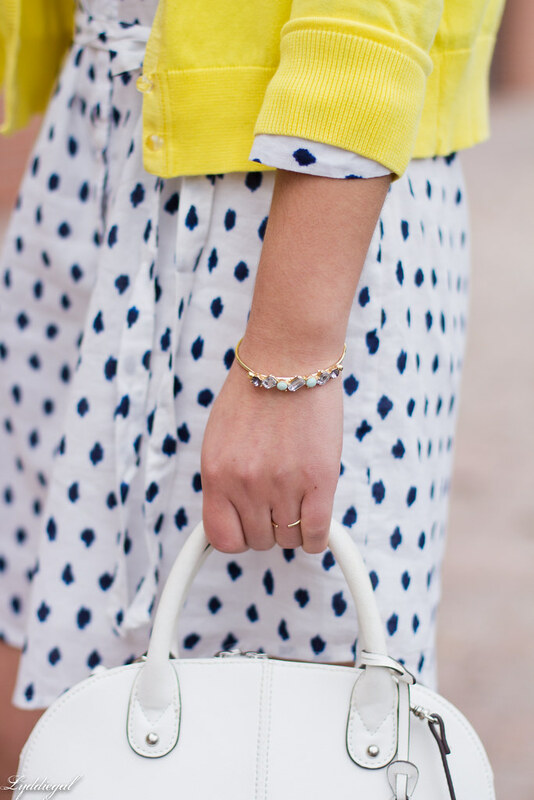 Ahh I am loving this entire outfit- the blue, yellow and white look perfect together. And the pattern on that dress is so nice. Have a great week. The color is back and better than ever! I love your dress so much. These colors together are so perfect too. Happy birthday!!!! You are one of my favorite people in this whole blogging world and I am so glad you had a good and chic day! Happy Birthday! I am so glad you had a wonderful celebration! You look beautiful! 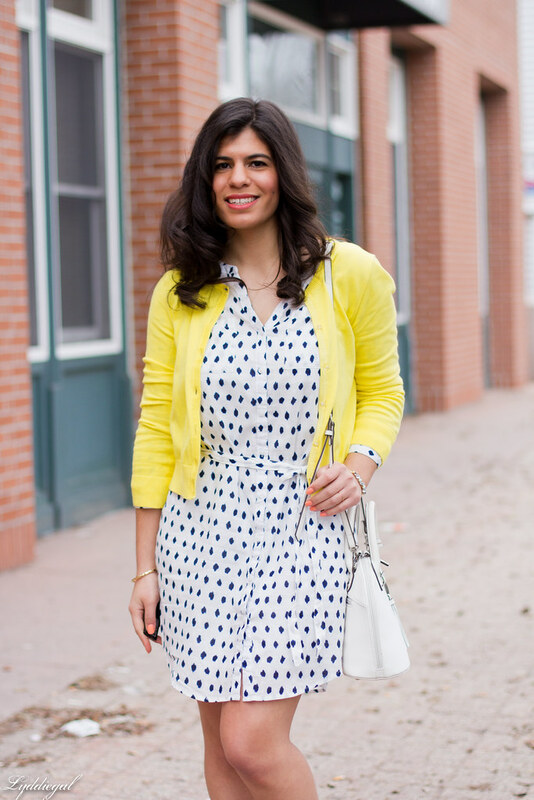 I love this bright, spring look on you, especially those gorgeous heels! Happy Birthday dear, This look says spring time!!! And I love it!!!! So glad you had a great birthday! 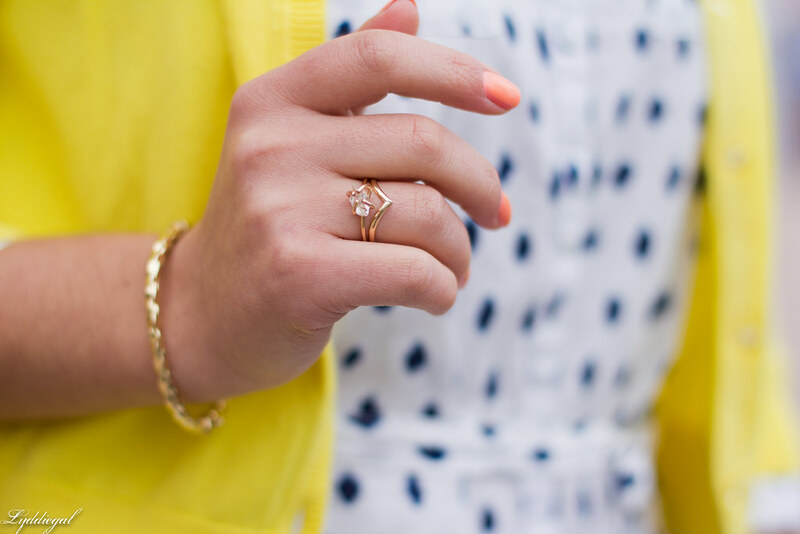 Love this springy look! That dress is so adorable. CUTE!!! love the outfit. Happy belated birthday. Happy Birthday! 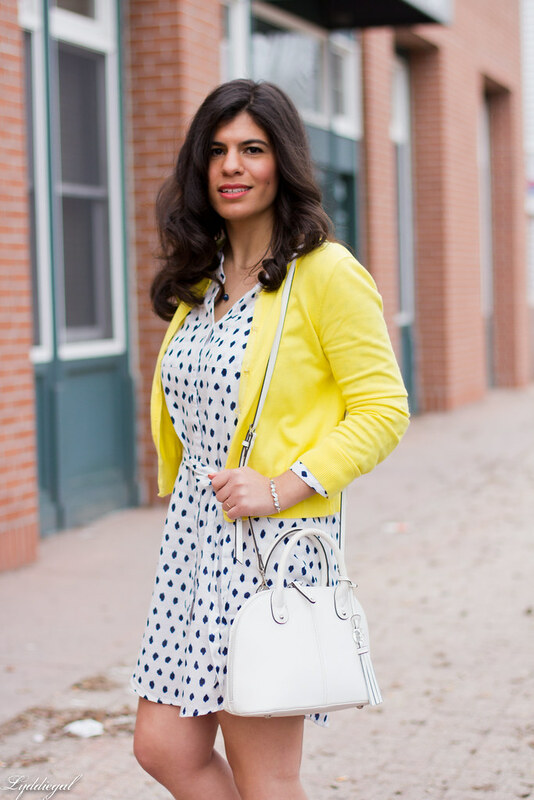 I love your polka dots paired with yellow, so pretty! this might be one of my favorite outfits of yours -- guess you get better with age! haha, happy birthday! everything here fits you perfectly, and the yellow brightens up your face even more than usual! :) love. I love that dress on you! You look incredible! I totally agree - I still feel like a kid! And I'm 30 years old with a husband! I often wonder if there's something mentally wrong with me, and I'm sure there is but it's nice to know we all have the same feelings about getting older. happy Belated Birthday, Lydia(these pics are gorgeous~:)! The title of your post is the best, I totally agree! You look so glowy and springy and pretty--love this look! Happy EveryDay you look relaxed and chic. That dress is so pretty and in my most favorite style ever. 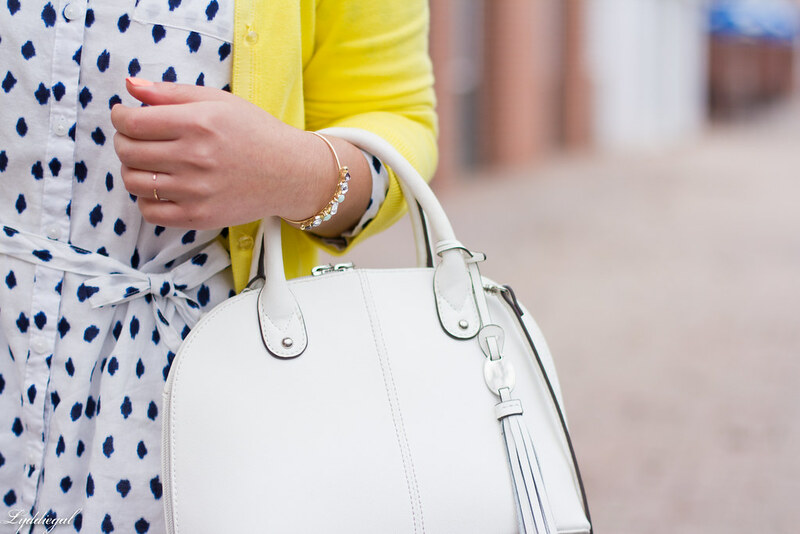 I love love when yellow is paired with black and white. You look adorable and so Springy! 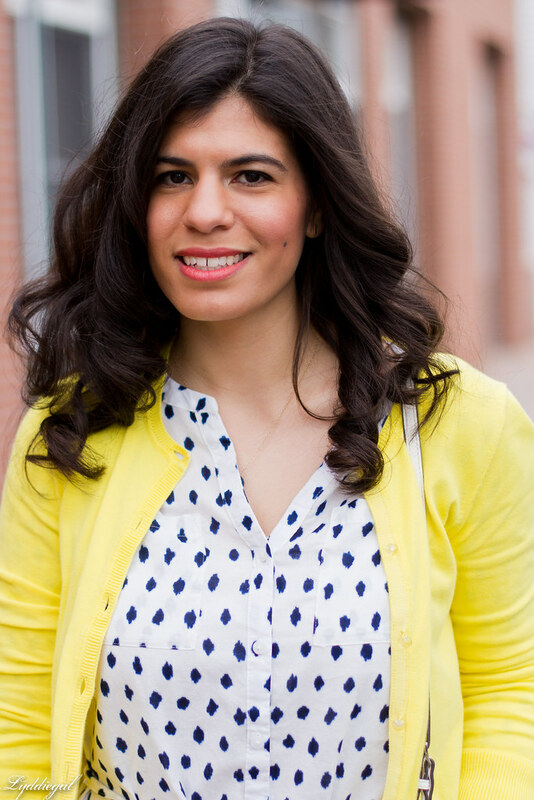 This is such a fun spring outfit! Love the shirtdress. I'm glad you had a good birthday! That dress is all kinds of beautiful on you! I skipped over it in the store and you're making me regret it!